| Posted about 1 year ago. Students from Stoneman Douglas in Parkland are among the speakers at Cornell this afternoon. Two Cornell students who are alumni of Marjory Stoneman Douglas High School in Parkland, Florida are among the speakers at the gathering on Cornell’s Arts Quad that will be heading downtown to the Ithaca March for our Lives rally. 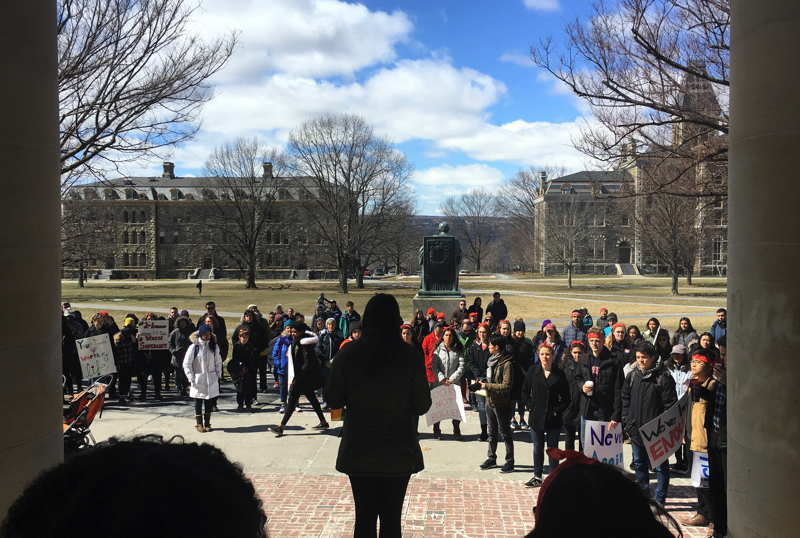 Chloe Cabrera and Samantha Nirenberg, both Cornell students who went to Stoneman Douglas, joined the speakers at the rally in front of Cornell’s Goldwin Smith Hall, behind the statue of the university’s first president, Andrew Dickson White. Students at Cornell and Ithaca College will march downtown to the Ithaca March for our Lives rally at the Bernie Milton Pavilion. More info on the Stoneman Douglas students at Cornell is at 14850.com.